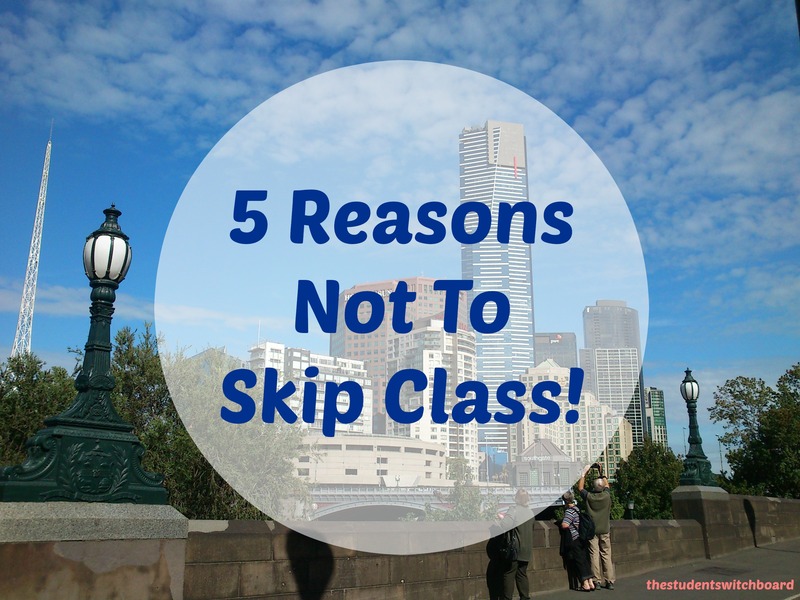 5 Reasons Not To Skip Class! There’s a certain freedom associated with heading off to university. For the past thirteen or even fourteen years of your life, you’ve been in school, with a strict timetable setting out exactly where you have to be and when, from 9 in the morning until 4 in the afternoon. If you don’t show up to class, your teacher will notice, you will be pulled up for it, and if you miss enough, your parents or guardians are probably going to receive a call from the school! When you go off to university, however, it’s like a whole new world! You might only have two classes in a day, and what’s more, you’ll find that there’s no-one there to chase you to them. Suddenly it’s your responsibility to get yourself to class and do the work! While some universities have a clock in system for their classes to monitor your attendance, no one really has time to run around after you. There can, then, be a temptation to relish that freedom a little too much! Picture this: you’ve been on a brilliant night out with your flatmates/classmates, and you have a lecture at 9am. You wake up at 8 o’clock feeling a little worse for wear, running on about three hours sleep and instantly regretting that bag of chips and cheese that you just had to have the night before on the way home! So what do you do?! Drag yourself out of bed and make your way to class, or hit the snooze button and snuggle back up for another couple of hours? Here are 5 reasons to do the former and get yourself to as many of your classes as possible!! 1. Not everything is in the lecture notes! The internet is a wonderful thing, and the ability to post information for students to access out of class is amazing. Despite what people tell you, however, not everything is included in the online lecture notes. They are usually just that – notes! Bullet points, or snippets to get you started. It’s often when the lecturer gets properly into the discussion that some of the most useful information comes up! A question from a student can lead the lecturer to say something that makes everything click into place for you – something that happened to me in one of my first year classes! If you don’t go to class, you run the risk of missing out on that crucial information! 2. Going to class gets you noticed! In school you’ll probably be one of about thirty children in a class, sometimes less. In a first year English literature lecture, you might be one of hundreds of students. Making the effort to go to your classes, your seminars/tutorials in particular, means you will be able to build a relationship with your lecturers/tutors. This can be helpful in the event that you’re struggling with an assessment, or need a reference for a future course or job. If your tutors see that you’re putting in the work, they are much more likely to want to help you! This one is particularly relevant if you haven’t moved away from home to study, but it applies to everyone! If you deliberately skip class, you won’t get chatting to the people who are studying the same subjects as you. If you make friends on your course, future group work projects will be easier, and you’ll have people to turn to for help/notes if you do end up having to miss a class at some point. Regardless of that, these are the people who have applied for the same course as you, so you’ll instantly have common ground and something to bond over – don’t miss out on the opportunity to meet people who might become lifelong friends! 4. Self-Motivation is a powerful thing! Pushing yourself to go to that 4pm lecture on the topic you’re least interested in when a Netflix binge in your pyjamas sounds like so much more fun is a great thing! Working on your self-motivation means that when you go out and get a job, or even more so, if you decide to start your own business, you’ll be used to making yourself do the work when there’s no-one else there to push you! 5. You went to uni to learn, right?! There are so many amazing things about university – the friends you make, the confidence and independence you gain, the nights out you might go on (if that’s your thing – it’s totally okay, however, if it isn’t, but more on that another time!) and the inspirational people you’ll encounter. When it comes down to it though, you didn’t spend all that money (depending on where you live, it can be A LOT of money! ), just to have fun nights out, did you? You could have had fun nights out and saved yourself a whole heap of cash by just going straight into a job after school! If you’ve gone to university it means that to some extent, you are interested in the course you’ve chosen, so don’t let that passion go to waste and enjoy the experience of learning about that subject! You might find that this isn’t the course for you and end up changing to study something else, but you won’t know that unless you go to your classes! So those are my top five reasons why you should fight the urge to curl back up under your duvet and get yourself to that next 9am tutorial!! What are your top tips for keeping motivated during term time? < Previous The Student Switchboard on YouTube! Next > Study Tips: Backing Up Your Files!